Fixing UNIX Commands After OSX 10.8 Updates can be pathetic as there are definite missing packages, packages with no more support etc. Here is how to fix them. I am using UNIX commands probably for a decade. The errors I got and the painful process I had to follow, I am quite sure, a new developer will get fatigued quite easily. The history behind fixing UNIX Commands After OSX 10.8 Updates is not glorious, I started to see the output errors like a newbie ! Fixing UNIX Commands After OSX 10.8 Updates is a must, you can not even use well known brew command. Now you can imagine the pain while using Cloud Server From Mac OS X Using iTerm or using git or at worse, you can not customize iTerm2 with Color Schemes, Syntax Highlighting, or may be they will not work. You can not install WordPress with command line locally. Probably you have understood the magnitude of the problem. But unfortunately, the steps can be painful. I am writing the story of how you can get all the things back without writing about the pain ! 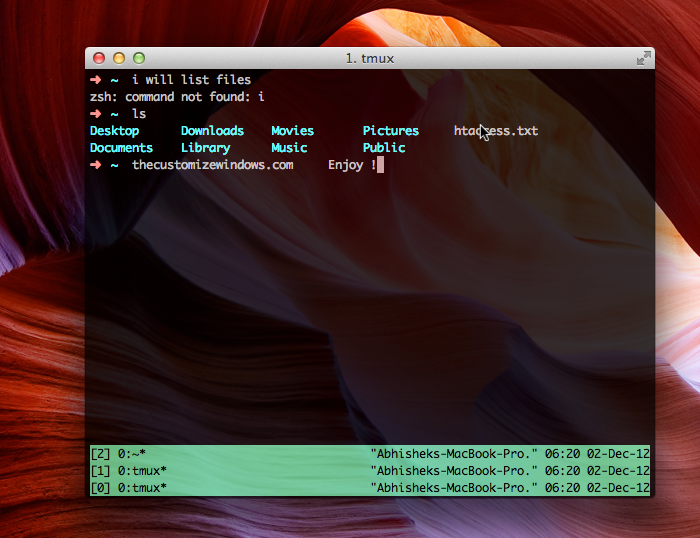 One important thing, iTerm2 has been used here as I do not use that pathetic Microsoft Windows CMD looking Terminal. Now go to Apple developers portal and download and install the latest version of command line tool for XCode. I am not giving link as they will update it. This is a must step. Change your user name with abhishekghosh. There are many funky things we usually love in black screen. You will get them GitHub. This Article Has Been Shared 9655 Times! Cite this article as: Abhishek Ghosh, "Fixing UNIX Commands After OSX 10.8 Updates," in The Customize Windows, December 2, 2012, April 25, 2019, https://thecustomizewindows.com/2012/12/fixing-unix-commands-after-osx-10-8-updates/.